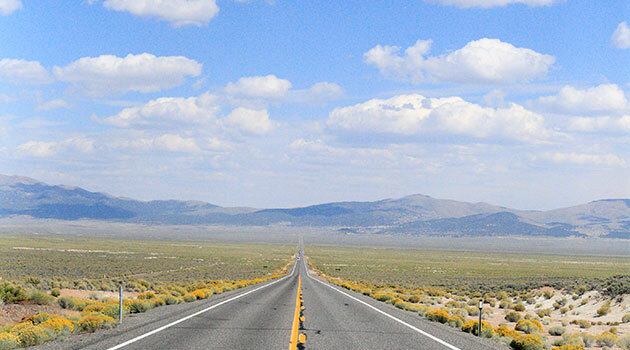 U.S. Route 50 wends through many states, but in Nevada, it is known as the “Loneliest Road” for its vast, desolate, starkly beautiful stretches. One may be the loneliest number, but in Nevada, that honor actually goes to 50. The Silver State’s portion of U.S. Route 50—which completes a full cross-country trek stretching from Sacramento, California all the way to Ocean City, Maryland—has famously been dubbed “The Loneliest Road in America” thanks to the vast expanses of empty desert it traverses. But there’s much more to the thoroughfare than meets the eye. The highway may be sparse in surroundings but it’s steeped in history, largely following old Pony Express routes and passing by plenty of old-timey stops, from ghost towns to western saloons where passers-by can still get a drink. And its landscape may be empty, but all that room just leaves more space for breathtaking views, from sandy dunes to desert plateaus to mountains to sagebrush to wide open skies. That’s not to mention the less natural aspects of the trip, which include a number of strange spots you have to see to believe. The Biggest Little City in the World lights up at night, but don’t miss the views to the Carson Range’s towering peaks during daytime. It may seem strange to start a lonely road trip in the Biggest Little City in the World, but Reno marks the official start of Route 50 in Nevada. Plus, before truly embarking on the lonesome pilgrimage, you may as well soak in all types of human interaction. Reno is situated just north of the road’s exit, eastward from the Sierra Nevada mountain range. 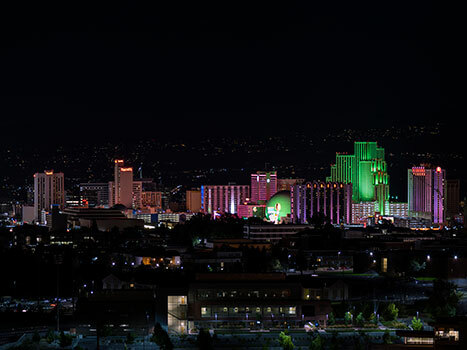 Reno is of course famous for its casinos, which offer plenty of excitement and entertainment for gambling types. But there’s much more on offer in the area, including botanical gardens, a safari zoo, a plethora of museums and science centers and even the National Bowling Stadium, which has earned the nickname “Taj Mahal of Tenpins.” But any roadtripper would be remiss to overlook two of the city’s top sights: the famous Reno Arch neon sign, which has welcomed visitors to the city since the 1920s, and the National Automobile Museum. The latter makes for a natural destination to kick off any driving journey and offers exhibits on all manners of rare and exotic vehicles, including ones that were owned by stylish celebrities like John F. Kennedy, Frank Sinatra, James Dean, and Elvis Presley. 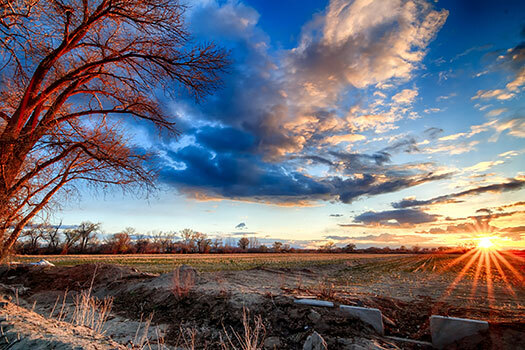 The sun sets over Fallon, Nevada, a quirky town on the eastern end of the Loneliest Road. About 62 miles east of Reno is the first “big” destination along the Loneliest Road: Fallon, Nevada. A remnant of the Wild West, this town may look quiet, but is brimming with strange activity just beneath the surface. In the case of the Project Shoal Monument, that’s quite literally the case. The site, technically located about 30 miles southeast of town, marks the place where the U.S. government conducted underground nuclear tests in 1963. According to the small granite marker found in the area—the only real landmark to be found in the otherwise empty swath of desert—the purpose of the experiment was to see what effect the explosion would have on seismic activity. Back in Fallon proper, more subterranean strangeness can be found at the area’s Hidden Cave, a trove of Native American artifacts discovered by four kids searching for treasure—although more likely of the gold doubloon variety. And more unusual sightings take root at the town’s local Shoe Trees, where patrons flock to adorn new branches with their worn-out sneakers. If all that oddness has you working up an appetite, you can grab some grub and something to drink at Fallon’s historic Middlegate Station, a beautifully restored site that harkens back to the Pony Express days of the 1850s. And while you’re there, make sure to fill up your gas tank—a rare luxury along U.S. 50. Nevada’s state dinosaur—the Ichthyosaur—once roamed the state’s Great Basin deserts when they were covered by a vast ocean. Its fossils now litter the area. Continuing along the Loneliest Road for another 110 miles will bring you to Austin. It may not be as musical as its Texas namesake, but lovers of unique destinations will still want to sing its praises. The area’s biggest draw is the Berlin-Ichthyosaur State Park, about 60 miles south of town, which holds the strange distinction of doubling as a ghost town and a former dinosaur haunt. The “Berlin” half of the state park’s moniker comes from the town’s original name. Built in the 1890s, many of the structures remain standing today and are testaments of a wilder time in this western expanse. The Ichthyosaur is for the dino that also once called the area home—back when Nevada was at the heart of a warm ocean. The aquatic reptile’s bones are found there in abundance, in a higher concentration than anywhere else on Earth. History lovers should also note Austin is home of Toquima Cave, another beautiful example of preserved Native American petroglyphs, which can still be seen in bright colors today, ranging from white to red to vibrant yellow. Ride aboard an old-time train at Ely’s Northern Nevada Rail Museum. Continuing eastward of Austin for 147 miles brings you to Ely, a small town with a little bit of something for every taste. The area’s biggest attraction is the Blue Mass Scenic Area, where the full breadth of the uniquely gorgeous desert landscape can be enjoyed. You can see springs and streams, granite cliffs, lush patches of vegetation, and historic pine cabins all from the park’s 7,000-foot elevation—and thrifty travelers can spend the night at one of the area’s various campgrounds. 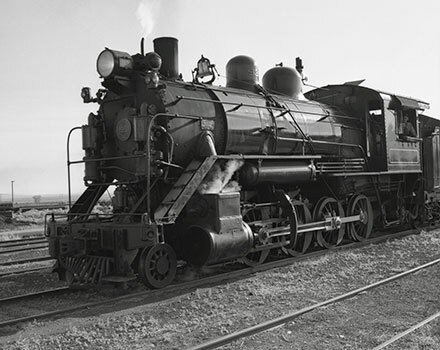 Ely also has a lot to offer for history buffs at the Nevada Northern Railway Museum, where patrons can glimpse some of the country’s original locomotives and catch a ride on a train pulled by a century-old steam engine. And for those with less conventional interests, Ward Charcoal Ovens State Park shouldn’t be skipped. The six large beehive-shaped structures lending the park its name were built in the 1870s and originally used for processing the silver found in the area. But after the nearby mines were largely abandoned, so were the ovens, and their uses became much more mysterious—including their rumored contribution as hideouts for stagecoach bandits. 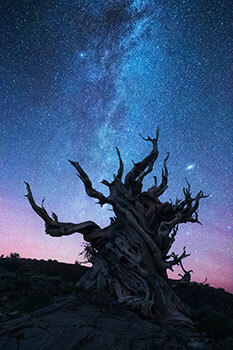 Gnarled and ancient, a bristlecone pine (some predate the birth of Christ in age) rises into the night sky at Great Basin National Park. The park is famous for its stargazing opportunities. End your trip with a spectacular national park whose name echoes the vast emptiness embodied by the Loneliest Road. Great Basin National Park is just 66 miles east of Ely, not far from the state border with Utah. The park is chock full of hiking trails, which have to cover a lot of ground to show visitors everything there is to see. Great Basin includes a stunning variety of geography, from the 13,000-foot summit of Wheeler Peak to the sublime subterranean Lehman Caves. In between, the park offers gorgeous opportunities to take in bristlecone pines and sagebrush-covered foothills. And the views at night are equally as breathtaking. Great Basin is renowned across the country for its dark skies and marks one of the best areas for stargazing in America. Staring into the vast expanse of space can surely make one feel lonely—and small—but it also offers the unique perspective to see the total wonder of the universe, and feel connected to it all at once.